If you can't find the snail in the photo above, it's because he's loaded down with thousands of cannibalistic babies—and most of them aren't even his. Dads in this marine species do all the egg-sitting, while moms scoot off to mate with other males. The males' willingness to care for the eggs of their rivals isn't just unusual: it's opposite to the standard rules of evolution. 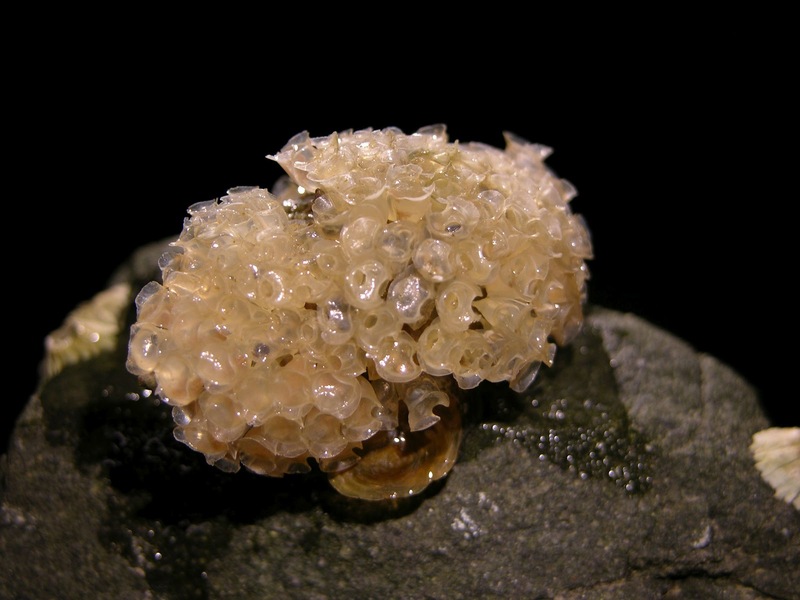 Rather than laying their eggs on, say, a rock, female Solenosteira macrospira snails glue egg-stuffed capsules to their male partners after mating. The male waits patiently for what may be several hours while the female produces and attaches the packets, which each hold about 250 eggs. By the end of the mating season, each male will have partnered with a handful of females (both literally and figuratively) and will be totally covered in eggs. It takes about a month for each "clutch," or batch of eggs, to turn into baby snails and crawl away. While he's waiting, the father protects the eggs and keeps them from being buried in sand or drying out during low tide. Meanwhile, females carry on mating with other males, never returning to the mollusk Baby Bjorns they've left all over the neighborhood. An evolutionary rule of thumb is that the more energy a male puts into caring for his young, the more certain he should be that he's the father. Care by dads is rare in the animal kingdom. It usually makes more sense for males to spend their energy mating with as many females as possible and hope some of their young survive. In other species where fathers care for the young (such as various fish, sea spiders, and giant water bugs), males guard females after mating or take other measures to ensure their partners aren't cheating on them. But since Solenosteira macrospira females can store sperm from many males at once inside their bodies, the dads getting eggs glued to them have no such assurance. And they don't seem to object. To find out just how bad the male snails have it, UC Davis researcher Stephanie Kamel led a daytime-TV-worthy investigation into snail paternity. Kamel collected 15 egg-covered males from the waters off the coast of Sonora, Mexico. "It's very obvious once you see the snails to tell the clutches apart," she says, because the batches of egg capsules left by different females have distinct shapes and colors. By examining the genes of about 90 embryos from the back of each snail, the researchers could guess what percentage of his eggs each babysitting dad had actually fathered. The answer was bad news for the dads. On average, males had fathered only 24% of the eggs they were carrying. A given male could be carrying babies from 20 or more other fathers. Researchers also looked at the genes within several entire egg clutches to find out how many different males each mom had mated with. They found that mothers were highly promiscuous: in a single clutch, they laid eggs from 10 to 15 fathers. This system might make sense if males truly weren't bothered by carrying around a backful of eggs for a few months. To find out, the researchers gathered many egg-carrying males and unstuck the capsules from their backs. Then they glued eggs back onto half of them and released them into the water, tethered to a 2-meter length of fishing line. 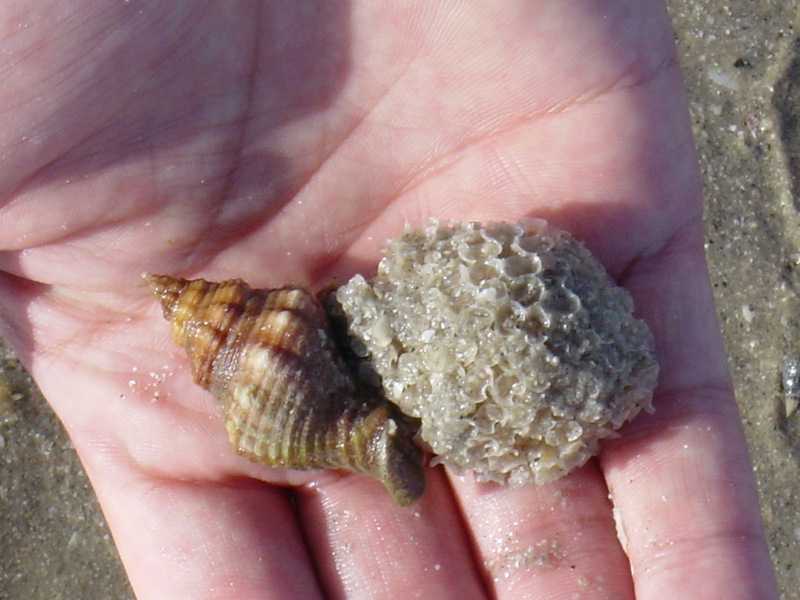 * After just two weeks, snails covered in eggs had lost about 8 percent of their body weight. But unburdened males were the same weight or had grown. Males sacrifice their health so they can cart around babies that are mostly unrelated to them. "This system is really cool," Kamel says. Which is to say, this system seems like it never should have evolved. One explanation, Kamel says, might be that female snails have a strong preference for males with eggs already glued to them. Males that try to get mates without carrying eggs "won't get any love, so to speak," she says. Females might even insist on gluing down some of their eggs before mating. For moms, coupling with a variety of males lets them produce young with many different sets of genes. Before they hatch from their capsules, these snail embryos will aggressively cannibalize each other. (She doesn't do much else for her young, but the mother does leave them with a large supply of snacks—in the form of their brothers and sisters.) Out of her genetically diverse babies, only the very fittest will survive long enough to hatch. Since at least a few of their own offspring are in the mix, babysitting dads would probably prefer it if their charges didn't eat each other. But if they want to have any young at all, the dads have to follow the rules. "At this point it really does appear that males can't do anything to improve their situation," Kamel says. "Females in this system seem to have won the battle in the conflict over parental care." Photos by Richard Grosberg. Top: a male covered in eggs. Bottom: a male next to a female. *The paper indicated that only 70 percent of snails were recovered at the end of the two-week period. "I'm wondering how one loses a leashed snail," I wrote to Kamel. She sent back the grim answer: "They get eaten by birds."